Know what to look for and you should be able to recognise market tops/bottoms as they are in the process of forming. Although you may not be able to pick the exact top of the market or the exact bottom of the market, through observation we have learned that the market cycles through a set of four stages. By observing the evolution of these stages you will be able to recognise a top or bottom of the market as it is in the process of forming. Please note: the four stages of the market are discussed in great detail in Module 6 of our Options Mentoring course. During the accumulation phase you should be busy looking for trades and analysing the stocks on your watch list. During this phase you want to be in a trade and manage your trade well. The market moves sideways. You should be taking profits or preparing to do so soon. 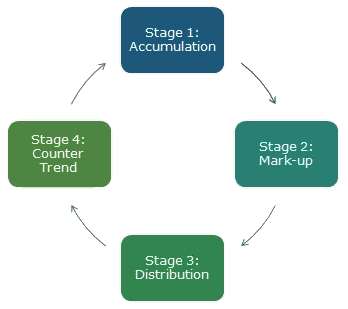 Understanding these stages is important for the timing of your trades.